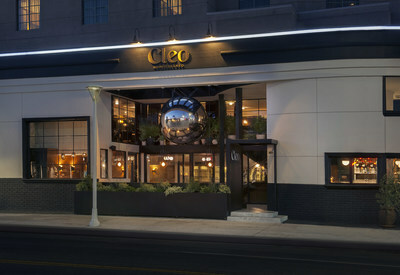 LOS ANGELES, Dec. 4, 2017 /PRNewswire/ -- Disruptive Restaurant Group, a subsidiary of sbe, the leading global lifestyle hospitality company, announced the group's award-winning Mediterranean culinary concept, Cleo, opened its third location in Los Angeles, and seventh location worldwide, on December 2, 2017 inside The Orlando Hotel, following its recent openings in Mondrian Park Avenue in New York and SLS Baha Mar in The Bahamas. 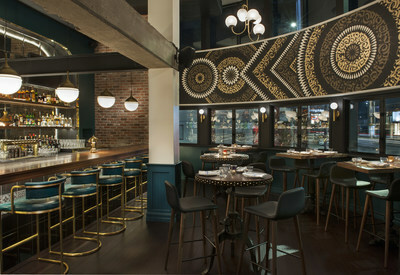 The new, 170-seat flagship restaurant brings an alluring new dining menu, unparalleled happy hour offerings and brilliant design by Dakota Development, DesignAgency and L.A. street artist Cryptik to the bustling culinary and cultural corridor of West Third Street. 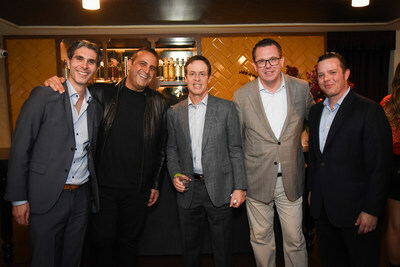 Prior to opening, Sam Nazarian, Founder and CEO of sbe, Daniel del Olmo, CEO of Disruptive Restaurant Group, and Executive Chef Danny Elmaleh celebrated with three exclusive preview dinners for friends, family and notable guests including Larry King, Michael B. Jordan, Randy Jackson, AnnaLynne McCord, Chloe Bridges, and Eric Dane. Chef Danny Elmaleh kicked off each dinner with a traditional Cleo plate smashing, inspired by the Ancient Greek ritual, and guests were served Maestro Dobel Tequila specialty cocktails, Whispering Angel rosé, Giuliana Prosecco, Duvel, and evian refreshers. On Friday, December 1st, sbe capped off the week-long celebration with a grand opening event in partnership with the Wall Street Journal's WSJ+ and close to 400 guests. "Building on the incredible reception we've seen with Cleo Hollywood and Cleo L.A. Live, we are thrilled to open our third location in L.A. and bring our award-winning concept to West Hollywood," said Daniel del Olmo CEO of Disruptive Restaurant Group. "West Third Street is fast becoming a go-to dining corridor in the city, and we're excited to open our doors in such a vibrant neighborhood and to welcome neighbors, friends, Orlando Hotel guests and visitors in for a fantastic, modern Mediterranean dining and drinking experience." "The Orlando Hotel has been a part of our family history for three generations and it has become a landmark on West Third Street," explained owner, Ken Pressberg, "So, of course, making a decision on the right restaurant partner is very important to us all. We are thrilled to be partnering with such a sophisticated and esteemed group of hospitality professionals as sbe, as we embark on this next chapter for our hotel." Executive Chef Danny Elmaleh added, "The new dishes on the menu, from our duck matzo ball soup to our meatball tagine with soft egg, tomato, squash and piquillo peppers, are directly inspired by my life, my heritage and the rich flavors of the Mediterranean and Middle East. We've seen a great response from our restaurants where the new menu is live – including our latest openings in New York and The Bahamas – and I'm delighted to share it with our guests at Cleo Third Street." Cleo Third Street opened with a new menu from Executive Chef Danny Elmaleh that reflects his Israeli-Japanese heritage and celebrates ingredients and cultures of the eastern and southern Mediterranean. The new menu spotlights Cleo cult hits including the restaurant's signature cocktails, Brussels sprouts, spicy cigars, and other shared plate favorites from babaganoush and crispy artichoke hummus enjoyed on addictive fresh baked laffa bread, to tagines, kebabs and octopus. Plus, larger, "family-style" dishes to share such as charcoal-grilled branzino served whole with fresh tomato and niçoise olives, snapper hot oil seared with Calabrian chili, olives and barberries and the Wagyu flat iron steak. The restaurant, now open for dinner, will also offer a weekend brunch, lunch, and a takeaway window with small bites to grab on the go. Cleo Third Street comes alive with vibrant and rich interiors brought to life by DesignAgency and sbe's real estate development subsidiary Dakota Development. From grand artwork to cozy accents—a giant seven-foot mirrored ball hanging over the outdoor reflects back all the dinners and activity below, evoking curiosity in passers-by; a rich, earth toned color palette; stunning tiled backdrops and mosaic accents that nod to the Mediterranean, to a custom mural by popular LA street artist Cryptik, titled 'FACING EAST'—all of these elements combine to create a captivating dining experience. Cleo Third Street comes on the heels of two big openings for the brand, including its first location in New York City at Mondrian Park Avenue and its first international outpost at SLS Baha Mar in The Bahamas. Additionally, the brand will continue its international expansion with the opening of Cleo Kuwait within The Avenues Mall, the largest shopping mall in the country, in early 2018. sbe has plans to open six more Cleo restaurants globally by 2021. Disruptive Restaurant Group is the leading restaurant company devoted to the development of visionary concepts and award-winning culinary experiences. A subsidiary of leading lifestyle hospitality company, sbe, Disruptive Restaurant Group incubates, operates and licenses globally renowned culinary brands. The company's critically-acclaimed restaurants include Katsuya, Cleo, The Bazaar by José Andrés, Hyde Kitchen + Cocktails, and Umami. For more details, please visit sbe.com/restaurants. Established in 2002 by Founder and CEO Sam Nazarian, sbe is a privately-held, leading lifestyle hospitality company that develops, manages and operates award-winning hotels, residences, restaurants and nightclubs. Through exclusive partnerships with cultural visionaries, sbe is devoted to creating extraordinary experiences throughout its proprietary brands with a commitment to authenticity, sophistication, mastery and innovation. Following the acquisition of Morgans Hotel Group, the pioneer of boutique lifestyle hotels, sbe has an unparalleled global portfolio featuring 23 world-class lifestyle hotel properties in nine attractive gateway markets and 136 global world-renowned hotel, entertainment and food & beverage outlets. The company is uniquely positioned to offer a complete lifestyle experience - from nightlife, food & beverage and entertainment to hotels and residences, and through its innovative customer loyalty and rewards program, The Code, as well as its award-winning international real estate development subsidiary, Dakota Development - all of which solidify sbe as the preeminent leader across hospitality. The company's established and upcoming hotel brands include SLS Hotel & Residences, Delano, Mondrian, Redbury, Hyde Hotel & Residences, and The Originals. In addition, sbe has the following internationally acclaimed restaurants and lounges: Katsuya, Cleo, The Bazaar by José Andrés, Fi'lia by Michael Schwartz, Umami Burger, Hyde Lounge and Skybar. More information about sbe can be obtained at sbe.com.